My children love taking vitamins. I'm sure that's because they come in yummy fruit snack-like chewy form. Wouldn't you be more excited about taking vitamins if they seemed like candy? I admit I've snuck some of my children's vitamins before just because they smelled yummy lol. I was recently given the opportunity to try out some adult chewable vitamins from Smarty Pants Vitamins. These are a complete multivitamin, including Omega 3s and Vitamin D. It also is made with no artificial sweeteners, colors, or preservatives! And it is gluten and casein free with no high fructose corn syrup. I know many chewable vitamins include a lot of those things, and are basically vitamin filled fruit snacks, but these are just about as healthy as you can get a chewy vitamin. They have a sugary citrus taste. They don't really taste like fruit snacks, so if you are expecting that you will be disappointed lol. But they are yummy enough to curb sugary cravings. And the serving size is 6 vitamins so it seems like a nice little sweet snack. 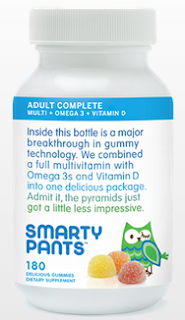 Smarty Pants Vitamins can be ordered online or can be found at Whole Foods and CVS stores. Go online to get a $5 off coupon on your first purchase. *Disclaimer: I was given a bottle of vitamins free to review. Opinions are my own, I was not paid to give a good review. I just found this review, and I really appreciate. I recently started using Gummy Multivitamins myself, and I really like Smarty Pants vitamins!